Hello my name is Kris, but my Mother and Aunt’s called me Krissy. I am a happy mother of 5 children, and 3 grands. I live just “Over The Mountain” on a lovely, narrow country road in the Appalachian Mountains. God’s beautiful creations are all around me giving me inspiration for my crochet designs at every turn. I am a seamstress as well as a crochet designer, and embellishing my crocheted items with bits of fabric, ribbons and lace comes naturally. I love vintage fashion and it is a great influence on my designs. 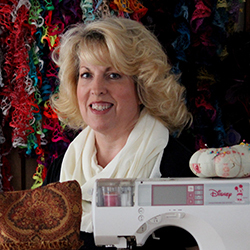 When I am not sewing and crocheting, I am happily serving my Lord and Saviour Jesus Christ. I also love to spend time on my side of the mountain, gathering flowers and picking berries for homemade cobbler. Life is sweet on my side of the mountain. Like my Facebook page so that you don’t miss anything that happens “On My Side Of The Mountain”! I am happily residing at Ravelry too! I have a wonderful Facebook group. We talk and chit chat about crochet and other crafts. I would love it if you joined us! Just Click Here and ask to join! Psst!…Don’t forget to sign up for my newsletter! It’s up there at the top of the page!